Nothing To Lose But Fat!, Issue #018- Get Skinny With Detoxing! The celebrating, as fun as it was, is past at least for now. January is here and it’s time for a new beginning. You want to actually lose weight permanently this year, right? Here’s the BEST idea for 2013 that I use and my successful clients use to reverse type 2 diabetes and get skinny and healthy! Most people who want to lose weight never seriously considering fasting. It seems like too steep a mountain to climb, you don’t have the will power, starving yourself never works or you figure it might be dangerous to your health. That’s a mistake. You don’t have to go on a month long fast. In fact, you don’t have to go on a week fast. What you DO need to do is incorporate 1 day or even 1 evening of detoxing every single week! Here’s how. Follow this plan to a new you. 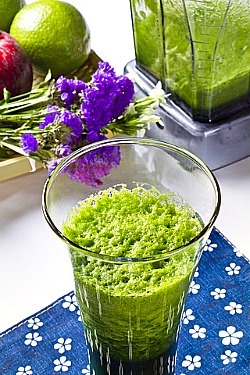 Green juicing will change your life for the better. Pick one day a week when you will only drink green juices. Pick a day when you don’t have other commitments so you can focus on a long hike, lots of green juices and no temptations. The critical thing is how you break that fast. The next morning have a whole grain cereal for breakfast with just a little plain yogurt and add raw nuts and seeds. Eat lightly for the day ... mostly fruits, vegetables, beans, raw nuts and seeds. Follow your body’s lead about what you need to eat. If you can’t manage a day, fine. Just commit to drinking green juices only one or two nights a week. If you need to eat more, eat some raw nuts (no more than 7) or 6 oz. good quality yogurt. This is a mini cleanse that will re-introduce your body to fresh, live enzymes. The more “live,” raw, green food you eat, the more you’ll want to eat. Flooding your body with antioxidants, minerals and vitamins regularly will transform your body and life. Have you visited Lifetime Fat Loss on Facebook? Many of my recipes are there and on Google Plus. Go to Facebook or Google Plus and just put Lifetime Fat Loss in the search boxes there. If you're wanting to finally lose fat in the new year sign up for a weight management consultation today and get your own Lifetime Fat Loss Plan for changing your life! Ask for a January appointment. What's new on Lifetime Fat Loss? A whey product that burns your fat in your meal replacement shake. A natural hormone support product that will help you re-balance your metabolism. A natural fat burner to really accelerate your fat burning. A pedometer that ensures you are getting in enough aerobic exercise to lose fat permanently! A very handy calorie counter that gives you everything you need to know about portion control. This is the product that seriously reduces the inflammation you have and helps you to detox. The best green tea extract to help you burn fat. Have you missed any past newsletters? * If you like this ezine, please do a friend and me a big favor and "pay it forward." * If a friend DID forward this to you and if you like what you read, please subscribe by visiting Lifetime Fat Loss.